It's been a busy few months, yet again my blog has gone un-updated for too long! 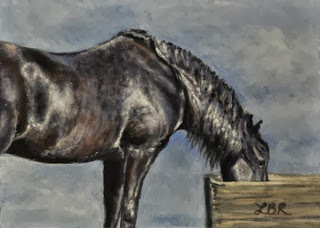 Since I last posted the Society of Equestrian Artists annual exhibition took place at Mall Galleries (I managed to get three paintings selected this year which I was thrilled about, two of which have now sold), I have kept up with plenty of life painting, and had commissioned work keeping me occupied. The little 7" x 5" painting pictured above is the first original piece of work I have produced since the summer, it is currently up for grabs on ebay starting at 1p (it had been bid up to £77 the last time I looked). You can find the auction at http://r.ebay.com/LK77AE, it ends on Friday evening. I have just collected several beautiful bespoke Harris Moore canvases from their shop, once of which is earmarked for the painting that this study was in preparation for- looking forward to getting started with it.